Observe how Democratic participation sharply drops after the Obama inauguration. 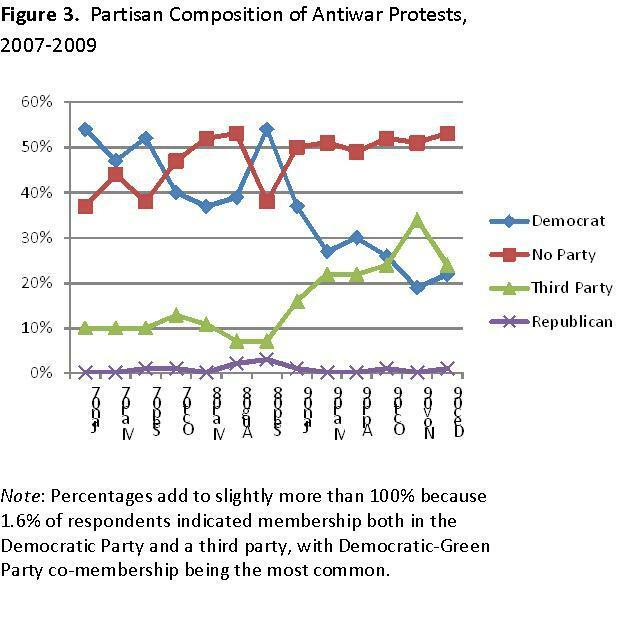 My collaborator, Michael Heaney, and I have a new working paper called “The Partisan Dynamics of Contention: Demobilization of the Antiwar Movement in the United States, 2007-2009.” The key argument is that the decline of the antiwar movement can be attributed, in part, to the fact that Democrats have stopped using the peace movement as a platform for anti-Bush sentiment. In other words, at its peak, the ranks of the antiwar movement were swelled by partisans. Once Obama won the presidency, and other issues emerged, the movement shrank when Democrats stopped showing up. The remaining protesters were more likely to be non-partisan or third party, and these non-Democrats were more likely to disapprove of Obama’s management of Iraq and Afghanistan. When Democrats gained power, the movement converged on a core of peace activists who were not strongly identified with the Democratic party. Conversely, there are conservatives like Jason Chaffetz who are now anti-war. This makes a lot of sense in the context of various brain scan/psych evidence that suggests people line up on issues depending on prior partisan affiliation; and that more generally people tend to first make decisions and rationalize them after the fact. Did the Democrats dump the anti-war movement, or did the anti-war movement dump the Democrats? Protesters I know are all sickened by Obama’s obnoxious belief that terrorists are not our friends. I wonder if some party-leaving occurred. John: Good point. We don’t have longitudinal data on individuals. We can’t see how many people quit being democrats with a before and after. But the evidence in the paper suggests that this isn’t true. Even controlling for when the protest occurred, the profile of democrats and non-democrats remains the same across time. You don’t see later period non-democrats who like like early period democrats. So, democrat party deaffiliation probably isn’t what’s driving the trend. Wait, what about the overall level of protest? If changes in the progress of the war (or just its coverage) cause the marginal protester to stay home, and if democrats are less committed to anti-war activity per se (as their major-party affiliation might suggest) then you would get the same effect. It’s unclear from a time-series of proportions whether Dems declined and others remained constant or whether Dems just declined faster. consistent with thorfinn, i think it’s amazing to remember that in 2000 GWB campaigned on an isolationist/realist platform that had slogans like “readiness” (ie, not deployed in the Balkans) and “humble” whereas Gore sounded like a hard Wilsonian. the realignment on foreign policy in the early-aughts (and re-re-alignment we’re gradually seeing now around Afghanistan) is consistent with the cynical idea that partisan affiliation -> policy preferences rather than the other way around. Very curious graph. Is there a reason the increase in 3d party participation looks so symmetric to the decrease in Democratic participation? Andrei: first, thanks for helping out – you collected some of this data! Second, I think the increase has to do with third party types simply not leaving. So they become a higher proportion. Perhaps Democrats stopped attending protests because they thought that, by getting their candidates in office, they had achieved the anti-war goal of a new administration who would change war policies. Given that, and Obama’s less than stellar responsiveness to this idea, perhaps you’ll see increasing Democratic involvement over the next year? Much of the anti-war movement was not simply anti-war, it was anti-Bush and anti-Republican, and yes, anti-American. Democrats and other non-Republicans protested the war, in part, as a way to protest President Bush. Democrats protested the war as a way to protest against Republican policies. Foreigners, and particularly radical Muslims, saw the anti-war movement as an additional front on the War on Terror and so supported the protests from an anti-American standpoint. Now that the Democrats are in power, most of those groups have gone home. Some think President Obama will end the wars, some don’t want their own side to look bad because they disagree with President Obama on the war, but agree with him on other issues. Sean, that’s a valid hypothesis. The alternate hypothesis is that it’s all partisanship – soon as Obama got elected, democrats took off. It’s hard to distinguish because Obama announced a drawdown, but not a complete pull out. Also, violence continues, with suicide and car bombs. In other words, war continues in Iraq, but maybe not so much for American troops. So you could easily argue “Mission Accomplished (again)” but you could also argue that Democratic partisans have given Obama the benefit of the doubt. Perhaps both views are correct. In the data, we have evidence that the antiwar protests were also Bush protests. For example, we ask people to list the reasons they showed up and anti-Bush/GOP sentiment was a huge reason, on par with the war itself. Anti-GOPism was a very common framing of the problem. Also, many of the antiwar orgs with democratic ties had their funds dry up pretty quickly and many collapsed. But once again, this may reflect the complex situation, drawdown (but not total exit) from Iraq and escalation in Afghanistan, as much as partisanship. Unfortunately, history has not provided us with a clean natural experiment! i agree it could be both… i guess personally, a big part of my anti-bushness was the way he handled the war. i guess i am trying to unpack the assumptions that go into the idea of being “anti-bush” which are separate from being against his policies. of course, it could (should) go beyond the war: economy, social issues, budget priorities, tax policies, etc. but i think its reasonable to assume that his role in the war took center stage in the widespread anti-bushness of democrats. Think about it this way. Let’s say someone is extremely partisan, then they approve/vote for the person/party and not the policies. A simple example: many important elements of the Obama HCR were done in Massachussetts first by Romney, yet Romney criticized these very policies. It’s pretty obvious that he’s showing a preference for the people associated with the policies, not the policy itself. In contrast, the issue driven person votes only for policies and not people or parties. The “peaceniks” you describe in the first comment fit this bill. As long as there is any presence at all in Iraq, they’ll be marching in the street, no matter who is the president. Of course, in real life, there are few people at either extreme point of the spectrum. Probably the best description is that people make judgments on the bundle of people and policies. If your party is in power, you probably guess that they are pushing policies you like, or are doing the best they can with policies you don’t like. If it’s the opposite, you asssume that these policies just represent what’s so horrible about the other party. From this perspective, you can then imagine antiwar crowds as being a mix of people: people for whom the war is just the worst aspect of an incompetent Republican presidency and who are just anti-war in general. So when a democrat gets in, the partisans give him the benefit of the doubt, while the policy protesters stick to protest. So when the other party is in power, protest is an opportunity for an alliance between these two crowds and the opportunity makes no sense when there is a new government. And the regressions to show bundling: self-identified democrats tend to give Obama a higher evaluation in his handling of the war than non-democrats. DEmocrats are more likely to say specific anti-Bush things and non-democrats are more likely to mentions specific policies (the war) or ideological issues (peace). The real test of the hypothesis is if you see a similar shift in the Tea Party when the next GOP president comes in. Right now, I’d bet that you get a high proportion of GOPers at Tea Party events. If I am right, that should drop when a GOP president comes in and all you’ll be left with is anti-tax extremists and third party populists. If I am wrong, they will still rally in large numbers and insist that the new GOP president repeal HCR. I know for a fact that many anti-war progressives and democrats have left the party in order to support / vote for Ron Paul, the only candidate truly advocating for non-intervention and an end to the wars. I don’t have data on it, but I do volunteer with Ron Paul’s campaign currently, and I can tell you, there is an influx of both disgruntled democrats / progressives AND tons of pissed off republicans. I view this as a very good thing.